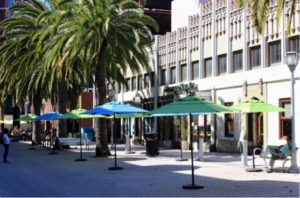 The Redwood City Improvement Association (RCIA), a community benefit district that works to enhance Downtown Redwood City, is installing 30 green and blue umbrellas in Downtown Redwood City and 10 tables and chair sets along Theatre Way. There will be 20 umbrellas in the Courthouse Square and 10 umbrellas on Theatre Way accompanied by 10 tables—each with four chairs, activating Downtown Redwood City’s public spaces and making the Downtown a more desirable place to come and enjoy. The umbrellas, tables and chairs will be available to the public on Monday through Friday.